The second week began with sunshine, and after failing to see any otters along the lochside, I headed to look at the marshes. At the end of the road, some of the cattle had made their way from the enclosures and out in a bid for freedom, blocking my route. As such, I diverted down the old road track and then spotted something dark perched on one of the posts. Handbrake on, bins up and a gasp of delight, as I realised I was looking at a perched merlin. I approached slowly down the track to as close as I dared, turned off the engine and leaned across the passenger seat to grab some shots. What a lovely little raptor. 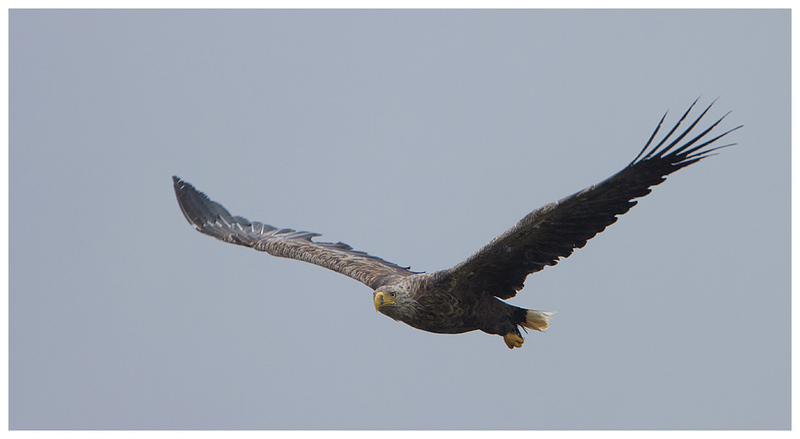 Just up from it had been a hen harrier too, but as ever, that had taken flight before I could start to approach. I could see the sunlight was moving across the marshes towards us, turning the vegetation to gold, but by the time it reached the posts, the merlin had taken flight. Not a bad start to the day, which would mark the beginning of Steve and Ann's first visit to the Isle, so we headed up to the agreed rendez-vous, and from there, to Salen, as they wanted to photo the boats. With that tourist visit out the way, it was over to Kellan to tick off WTEs from their list. With 2 sat in the trees, that was easy and Steve managed to spot the local otter heading out of the loch shortly after, to address that tick too. 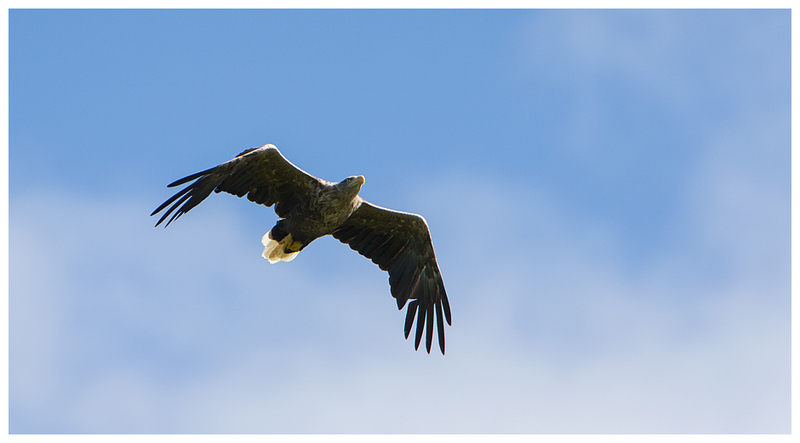 A short drive away and we were in an area I know is good for golden eagles, and with their beginners' luck in fine flow, we spotted a pair of adults with a juvenile, soaring over the hillsides. 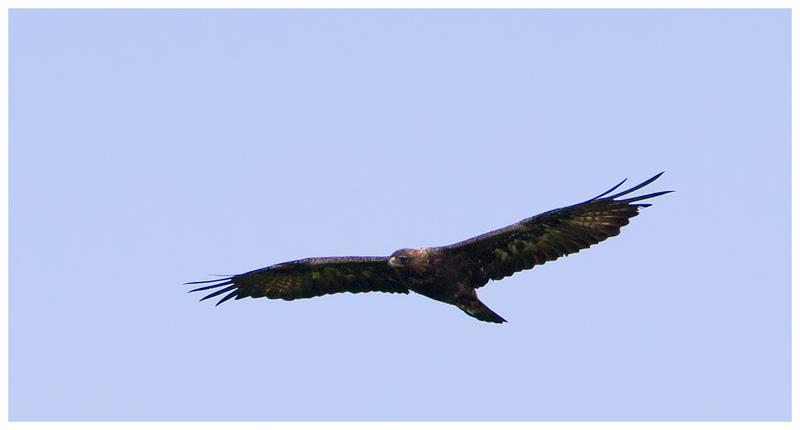 I gave chase along the coast, but a group of ravens headed the eagles off, and they all flew inland. Without having to wait to be let into the cottage, as we were already in it, we headed back, via the scenic route and were rewarded with fabulous views of 3 more WTEs, including seeing them flying almost on top of each other, and landing on the hillside, plus a pair of goldies too. 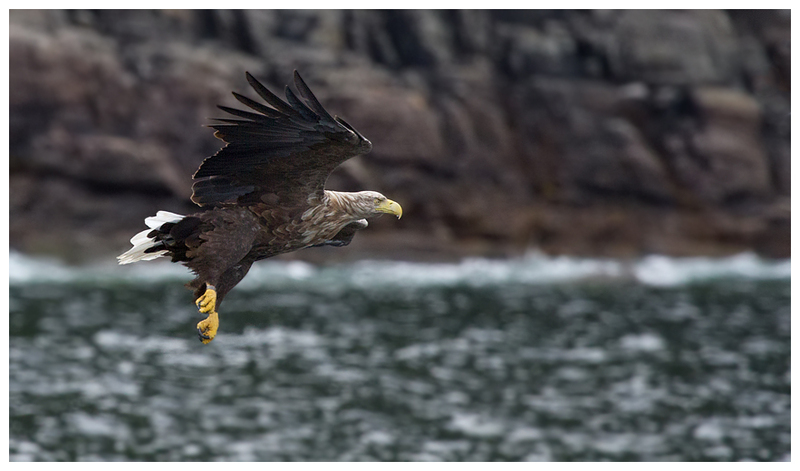 An incredible start to the stay on Mull for Steve and Ann. For this second week, I would have a partner out early mornings, albeit in a separate car, and as with trips with Ian, we had CB radios for comms. So handy and turned Steve into a child, with his "Rubber duck, rubber duck come in this is Donald" calls over them! Sadly his luck with the birds didn't work on the harriers, which vanished in front of us both, but it did seem to still have an affect with the eagles, and, as he clattered over the cattle grid at the cottage, he spooked a WTE from the shore, which must have been a sight as it flew past his car and under the phone-wires alongside the road. By the time I'd got back, the WTE was hanging in the breeze over our heads, looking left and right for targets. Apparently the domestic wildfowl at the end of the road are one popular target, but with folks around that area, it headed out across the loch and dropped down in pursuit of a gannet. Goodness knows what the gannet must have thought when it spotted this monster approaching, but mercifully for the gannet, they're faster at flying than WTEs, and soon left it behind. With all this local excitement, it seemed pointless heading anywhere else, so we headed around the back of the loch in the hope of seeing some of the waders or wildfowl that loiter around a stream back there. By now it was raining quite hard, and I dropped the window to keep the car from misting up. I could hear the oystercatchers, swallows chattering and... eagles calling! Scanning the trees along the hillside revealed one of the local WTEs perched, eating something among the branches, and the continous calls lead me to another, further along the treeline, perched on some dead branches. Oh to have seen these when it was nice! 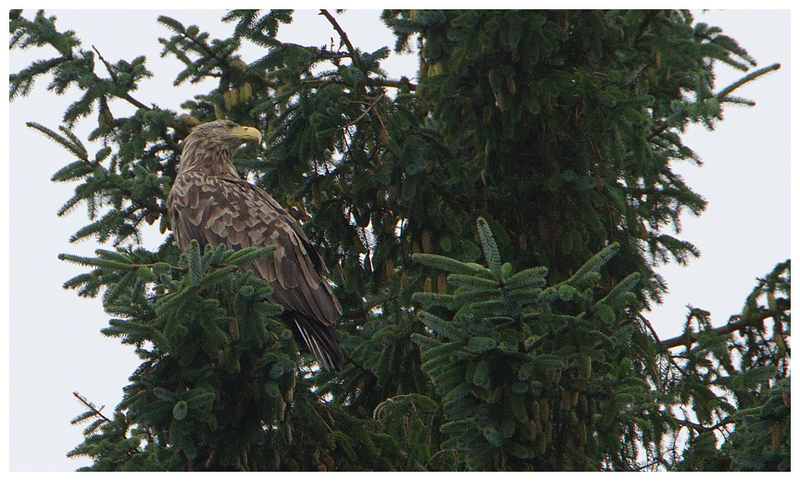 Even so, a scramble up the road resulted in some close views of one perched, which got better when it flew towards me. Monday was forecast to be one of those wet days from last year, and proved to be very wet. Even so, we chose to show Steve and Ann some of the isle, calling into Tobermory for a fish & chips lunch, and ending up at Calgary Bay where Steve spotted a large dark fin in the water. 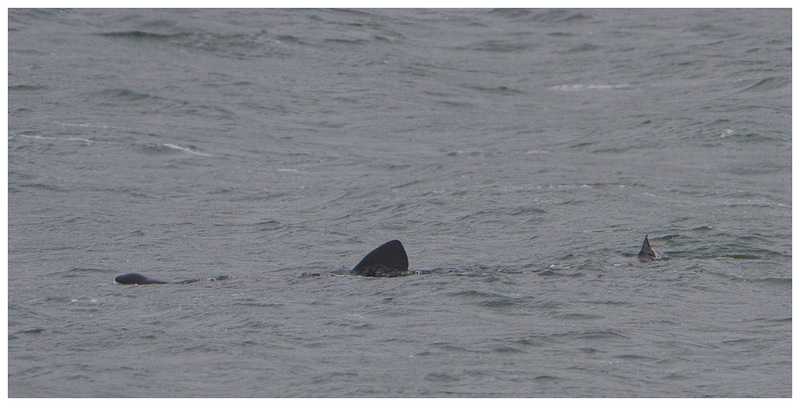 A basking shark, which was pretty close in. 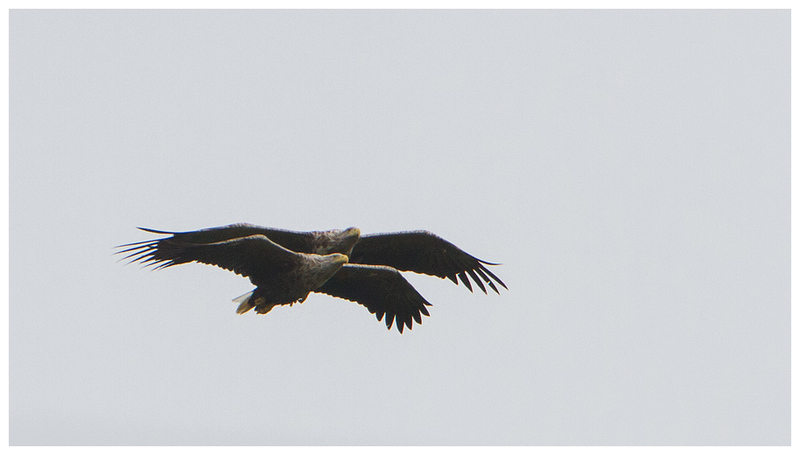 There were three initially, but by the time we had relocated to a loftier viewing spot, only one was left. First ones I have ever seen and they're massive. 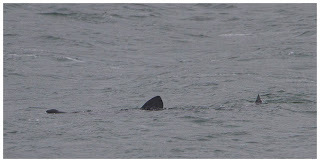 Had you seen the film Jaws and didn't know how harmless these sharks are, but spotted the fin as you swam, I'm pretty sure the water wouldn't remain clear. When the nose broke the surface and the tail was flicking behind, the full scale of the fish was clear, and it dwarfed an otter that was fishing closer to the shore. 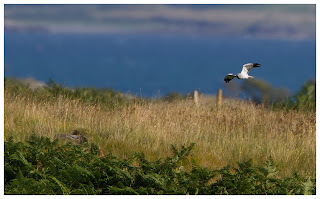 More WTE antics entertained us on Tuesday, again near the cottage. 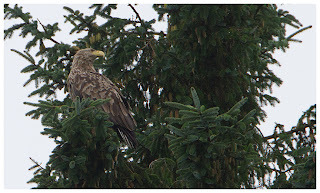 Steve spotted one of them perched in a tree behind the road, but it flew out into the loch channel in search of food. Steve was watching from one location and me from another, and when it moved, I let him know, assuming he'd join me. 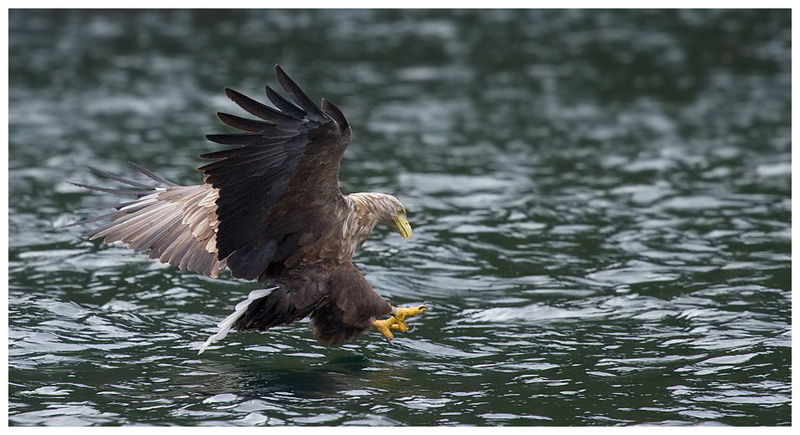 Before he could reach me though, the eagle took off, and flew low across the water, right at my car, before diverting along the loch. 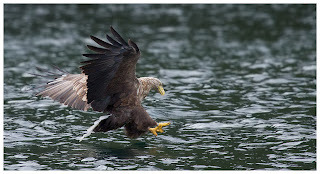 An awesome sight, and he got so close I could see some seaweed on his beak! Unfortunately at the time of the eagle approaching, my lens hood clip decided to give up the ghost, firing a screw off into the footwell and leaving the hood held on by the waterproof cover alone. Not ideal, especially when I realised I'd lost one of the screws somewhere on Mull. None of us had any tape nor did the cottage contain any, so I tried the local store. With a stroke of luck, I bumped into a local handyman at the store who gave me some strong tape, and moments later, in a Blue Peter style, I'd taped the hood to the lens. Not great but better than not having it in place. Another example of how friendly folks are on the isle. I owe you a pint, kind sir! 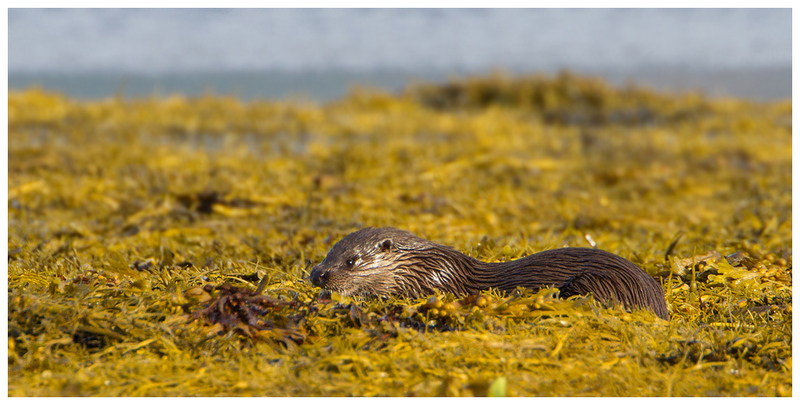 Lens sorted, I rejoined Steve, Ann and Dad who were tracking an otter down the shore. Steve had got right to the shore, whereas Dad, Ann and I stayed a little further back, though none of us had great views as it repeatedly came ashore to eat its catch. We carefully moved around for a better view, and were hoping for decent shots when the otter suddenly seemed spooked, and headed out. Looking back to the road revealed the cause. A pair of tourists in brightly coloured coats had decided to walk over the rocks towards us, in plain sight. Great. Without thinking about the fact they might undo our stealthy approach, or wonder why we were all crouched amongst rocks and seaweed, they just strolled on over. It'd be nice if folks watching photographers engaged their brains before approaching. 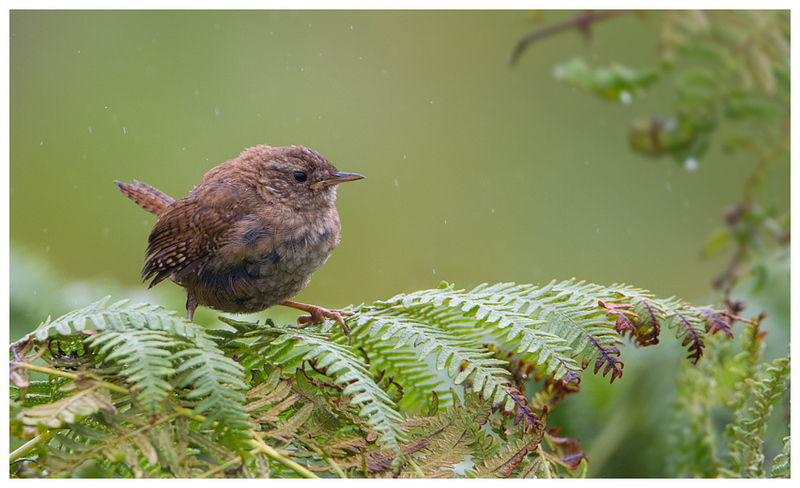 Photographing wildlife is a test of patience at the best of times with the subject, other wildlife, weather, light and luck involved, without having to contend with muppets too. Rant over. With the otter seemingly gone, we were left to it, and after a while the otter returned, and we managed to get some shots after all. We had been booked to be on the Lady Jayne this week, but the inclement, stormy weather at the start of the week had pushed the trip back to the Thursday. Having whet their appetite for seeing the WTEs, I had had all fingers and toes crossed for the boat trip, as it's an experience to treasure. Sadly on Thursday morning reality bit. Ann had suffered a relapse with her bad back, and when I got up she'd been unable to even put her socks on it was so painful. And Steve was apparently suffering with an upset stomach, which transpired to be from his own greed; he'd scoffed an entire box of fruit breakfast bars the day before. On arrival, we eventually spotted the pair high up above us, circling. Despite the gulls taking the bread, the eagles continued to circle, before one headed off, at speed out towards the coast. I have to admit, I feared the worst. Floating in the loch, we had a drink and I started to wonder if I could persuade Martin to try the other site - maybe offer something towards the diesel! But I didn't need to. Martin had already decided to chance it, and he set sail as fast as the LJ could go towards the other site, calling the shore along the way to delay the second trip. 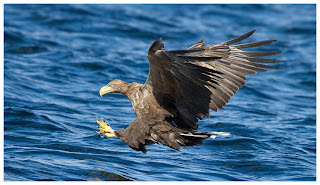 Approaching the cliffs, despite the trail of bread on offer, no gulls were around to alert the eagles to our presence, and I was about to comment on this to Dad when we caught sight of it, hanging in the sea breeze, only a few feet above the boat, looking well, enormous! No wonder there weren't any gulls around! Fish thrown out, down she came from the clear blue skies, to grab it gratefully, and return to the cliffs. Brilliant. 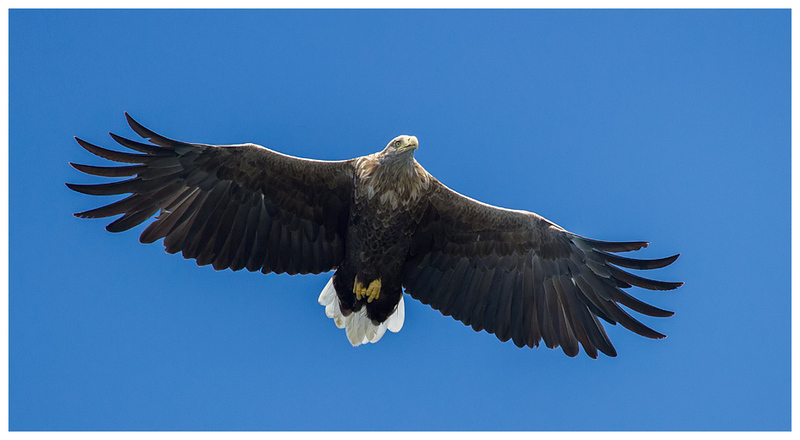 And a short while later, she came back out, and repeated the trick, giving me the best views and photo opportunities I've had to get shots, with blue sky, blue water and a colourful eagle as the subject. Simply wonderful. 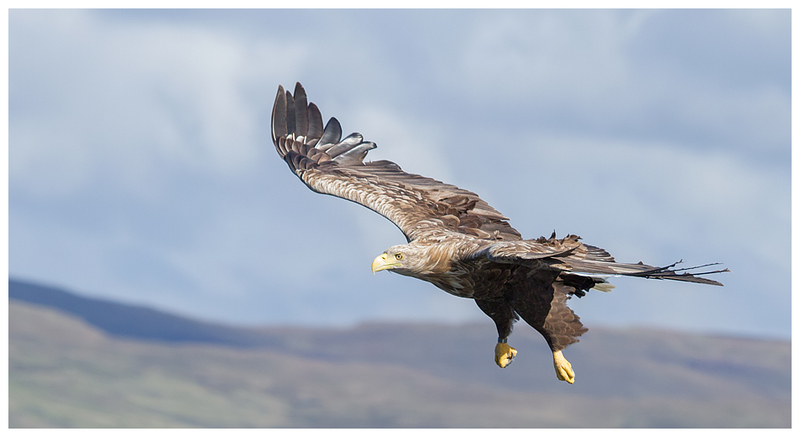 While the eagle was the star of the show, I think we were all very grateful to another star, Martin, who quite literally took us the extra mile(s) to ensure we got what we hoped for. Hats off to you! As we were in the area, we tried Calgary but no sharks this time. 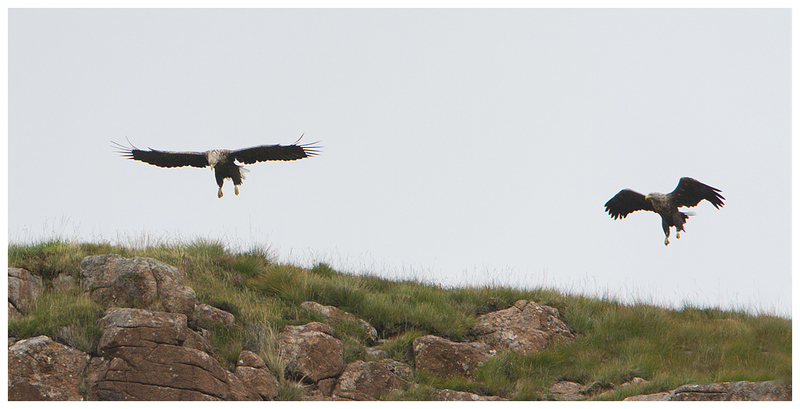 Though on the way back, being nosey as to what someone else was looking at proved wise, when we picked up a pair of golden eagles flying low along the hills. Never a bad thing to see. 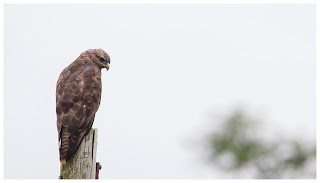 And one even landed on a post, just to disprove the theory of it always being a buzzard seen sat on one. Friday already. Two glorious, wildlife-filled weeks living on the heavenly isle had flown by, and while my heart was starting to sink, I made sure we got out and enjoyed it, starting on the marsh for the last time. A hen harrier perched at a distance, just to remind me of another year that I'd failed to get close to one. 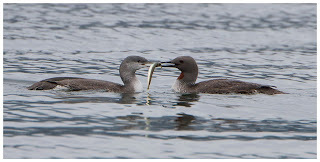 The Lady Jayne visited the Kellan site and we watched the adults fly out to collect fish for the vocal juvenile, though the male opted to take the second catch off elsewhere to eat himself. 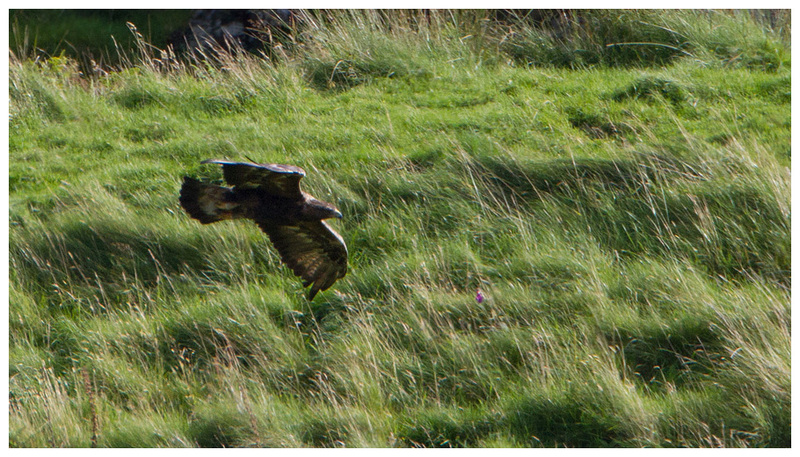 More views of a golden eagle followed, though of a juvenile this time and I tried to immerse myself it it, absorb the wonder of watching something I'd probably not see again for months. It's something Steve didn't immediately grasp on his week up there, as while he was watching the eagles on the first day, he was bemoaning the overcast skies not being great for photos, while I was trying to explain the fact he should be just enjoying the sight (and grabbing record shots). 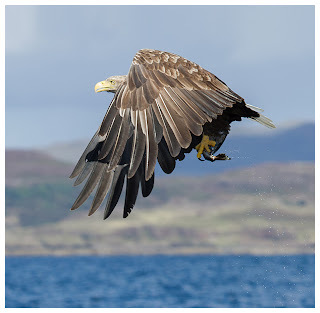 But by the middle of the week he'd changed his tune and admitted he couldn't believe he had been watching eagles hunt, otters fish and that the Mull scenery had taken his breath away. Smitten with the isle, already, both of them. I completely understand. The day ended with a colourful sunset, turning the loch from orange to lilac. I ignored the midges to photo it as well as I could. I hoped the sunshine forecast for the Saturday morning would fail to arrive, as leaving the isle in such weather would be heartbreaking. Saturday morning, time to leave. It was pouring down. Made it easier, but I was still gutted to have to go. And as I thanked the new owner of the cottage for the stay, I accidentally made a booking for next year. 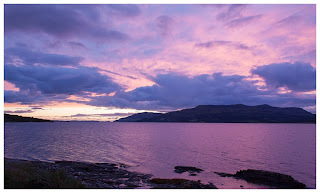 For anyone who knows me or reads this blog, it's pretty apparent how much I adore the Isle of Mull, so I find myself counting the months then weeks before going. The last couple of weeks at work flew by and I soon found myself tootling up north, with Dad in tow as usual. The drive up was uneventful and the B&B great again. I even saw a peregrine falcon over the car park in the morning. As with last year, after a brief shopping spree in Tescos, we were one of the first on the ferry and hence first off it too, immediately heading around to see if the white-tailed eagles were on show at Kellan. They weren't! In fact not much was apparent anywhere apart from something lacking from last year; sunshine. The afternoon turned out to be lovely so we took advantage and photographed the scenery in such conditions. The bright sunny weather really transforms the island, making the scenery so vibrant. The only wildlife sighting and hence pics taken that first day were of an otter, fishing on the loch near the cottage at sunset. Sunday was calm, sunny and very warm. Wanting to photo as much scenery as we could, we headed right up around Na Keal, up past Treshnish and over to Calgary. It became apparent that the breeding season had been kind to swallows, martins, pied wagtails and pipits, with flocks of the latter scattering from the roadside as we drove along. Also seemed to be more stonechats around, though very few wheatears. In terms of wildlife, we saw a distant golden eagle on the moors near Calgary and a ringtail hen harrier on the marshes, but that headed off up the hillside and out of sight. Seems that fine weather makes the wildlife go into hiding. 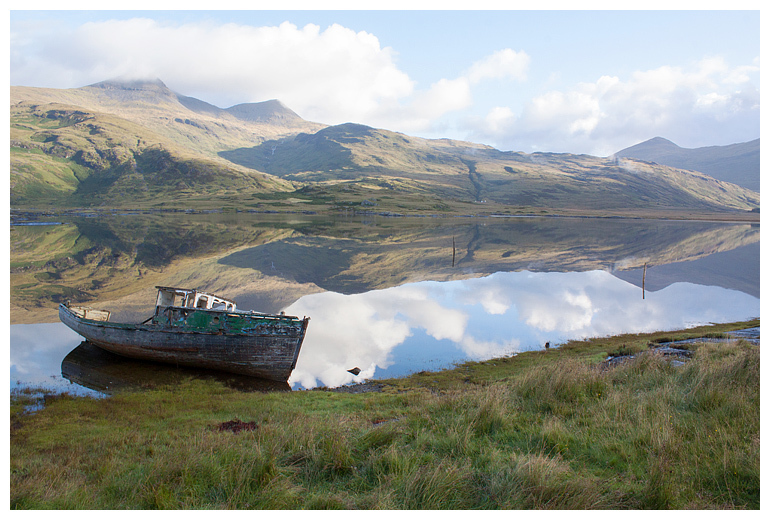 After the brightness of Sunday, Monday morning was rather gloomy, but the loch was like glass. With a trip aboard the Lady Jayne booked for 10am, I didn't bother with my usual morning trip out, getting up after Dad for once. I did see him out front though, and realised he'd spotted an otter. Watching his step down the slope to get a bit closer, he'd not realised that the otter had resurfaced, and he had been made by it. 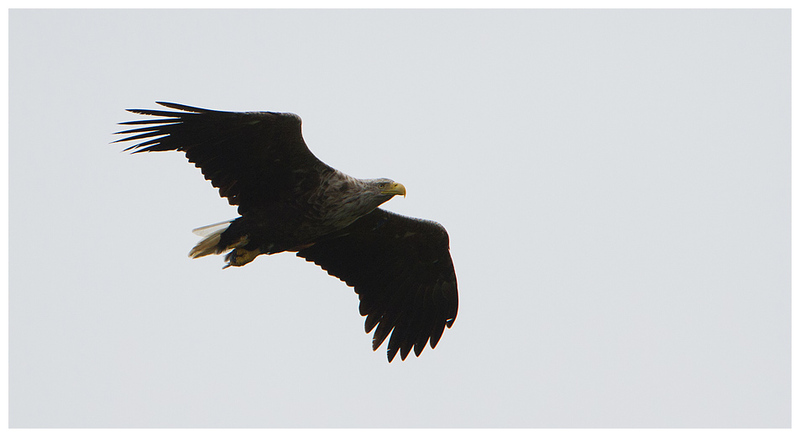 It headed along the loch but I'd seen this and from the cover of the road, I could follow it. 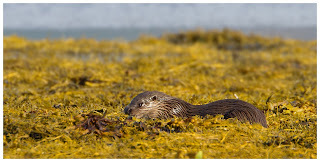 As usual, I'd not had chance to douse myself with Jungle Formula, so put up with the biting midges to grab a couple of shots of the otter as it came ashore, before it headed off across the water. 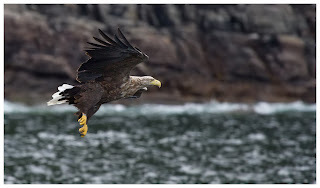 Having been on the Mull Charters trip every year since 2010, it surprised me when we didn't head to Kellan, but out across the bay to "The Wilderness" where there is a second nest site, which Martin has been visiting for 3 years now. Martin had also been joined for the season by Rachel, who had studied white-tailed eagles for her degree, and must have been delighted to get a place working on the best tour on the Isle! 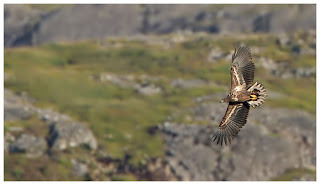 She was informative about what we were looking at and good a spotting things, such as a peregrine hunting the cliffs. 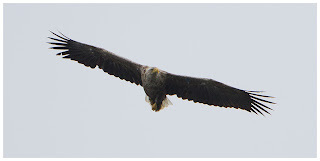 It was cloudy though, the cliffs dark and hence the water dark too, but I was chuffed to find the 7D and 100-400mm locked on to the eagle as it headed down, and stayed on it until it had taken the fish. The resulting images look surprisingly good, and also show how something so huge, given the right conditions can blend into the surroundings. The drive back consisted of many "Buzzard on a post" comments, and we managed a few shots of one which didn't fly away. From outside the cottage we could hear the divers on the loch calling, and patience yielded some reasonable views of an adult with a juvenile, perhaps teaching it how to fish. 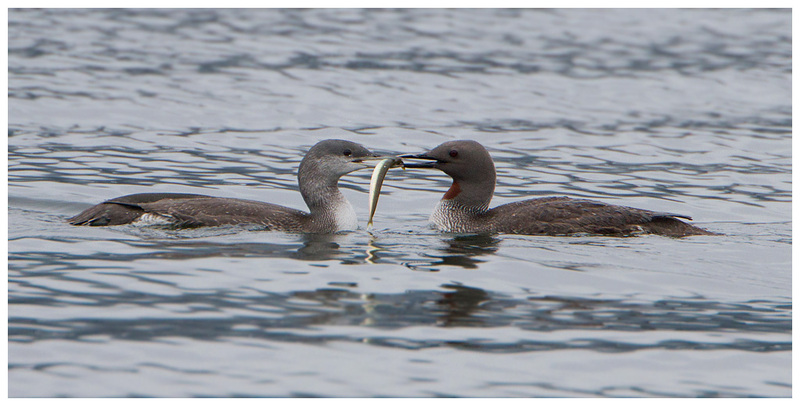 In one interesting moment, the adult presented its offspring with a fish. Very kind of it! Tuesday already, and it started wet. But I was determined not to waste a moment, and went out early anyway. 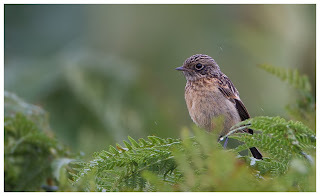 One sheltered corner of the loch was home to several smaller birds; pipits, stonechats, wrens, robins and even blackbirds. So when (as usual) the hen harriers weren't on view, nor the otters, I parked up there and made do with these other local characters. They seemed to like watching me, from the safety of the ferns. By mid-morning, I'd returned to pick Dad up and head out for a look elsewhere. 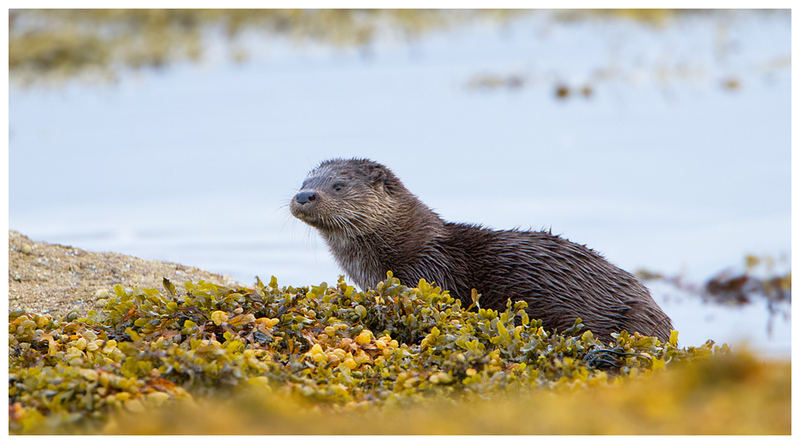 Steve (joining us on the second week) had suggested we look at Croggan, after reading in someone's blog of an otter being there. The road to reach Croggan was laughable - more track than road. But the views of the loch made it worthwhile. And we got sightings of a pair of golden eagles hunting behind the trees on the ridge behind the road, and also a white-tailed eagle, powering up the loch, against the strong breeze. 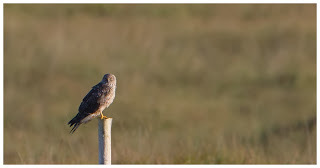 Parking on the road to Grasspoint, we were fortunate to spot both a ringtail and also a male hen harrier. Both were distant, but welcome to see. The lure of the pub at Craignure for dinner was too much, and after that, calling into the view point in the glen proved to be a great move, as I spotted a shadow circling below us, which rose up and revealed itself to be a juvenile white-tailed eagle, hunting the hillsides. It looked magnificent in the golden evening light. Midweek and another drive over to Kellan, though that was after seeing an otter rather close in on the shore near the cottage. 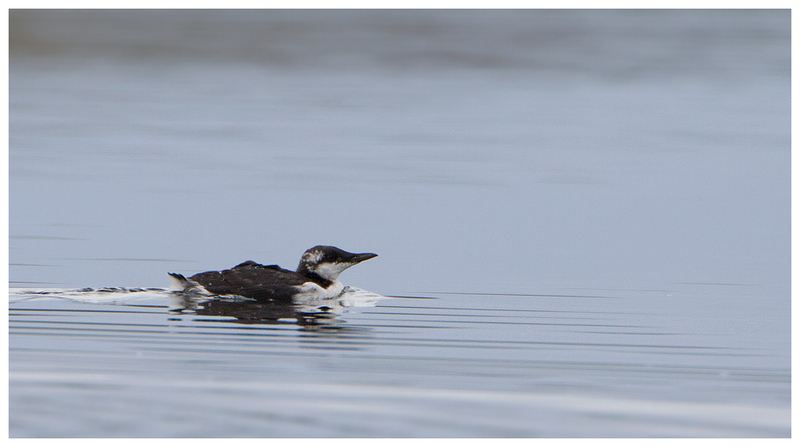 On the drive over we also saw a guillemot fishing on the loch, making rather a splash too. Maybe more noticeable on a mirror-like loch. From the layby, we got brief views of the white-tailed eagles perched, and that improved when they went out to the Lady Jayne on the loch. By then there were a few folks in the parking area including Peter Hall from Mull Wildlife Tours who was busy entertaining his guests. I tend to leave these tours to get on with things; not one for poking my nose in, though I will offer info if directly asked, on sightings that day, for example. However as I was watching the eagle head out, I spotted something unusual amongst the gulls. 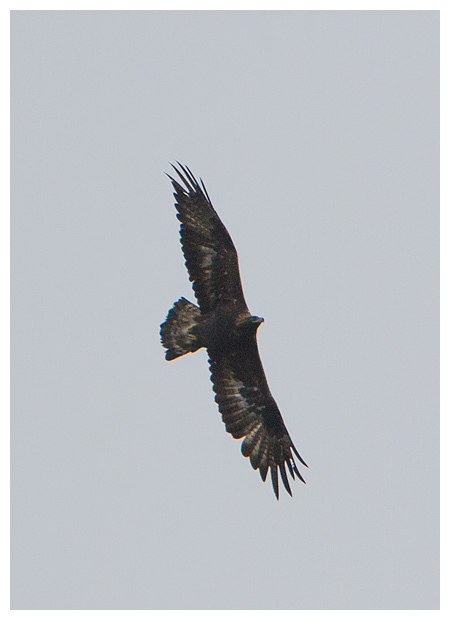 Brown, large and flashes of white on the wings. A bonxie!! I said it loud enough for the group to hear and Peter's ears pricked up. He was on to it in a flash and I reckon I made his day with the sighting. Turns out he went to school only a few miles from my house - another Brummie! 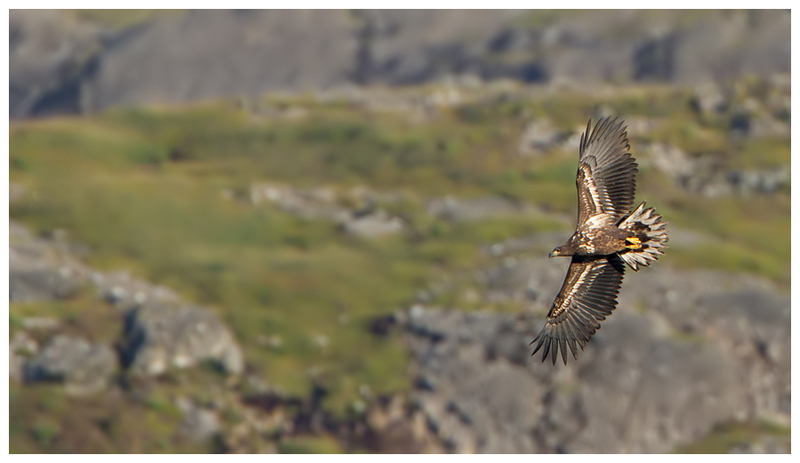 The Bonxie seemed to have a brief go at the eagle, perhaps more in defence than anything, before heading inland, leaving the eagle to collect the fish. With the eagles returning towards us, I managed to get some shots with the mountains as a backdrop. Calling into the Gorten area again on the way back, we saw 3 hen harriers this time, though none close (theme developing here) and also a pair of WTEs flying along the coast. Too far for shots, but fabulous to just watch. More gloom on Thursday and I couldn't see the loch first thing! When it lifted, the local otter performed some more magic and vanished in front of me. 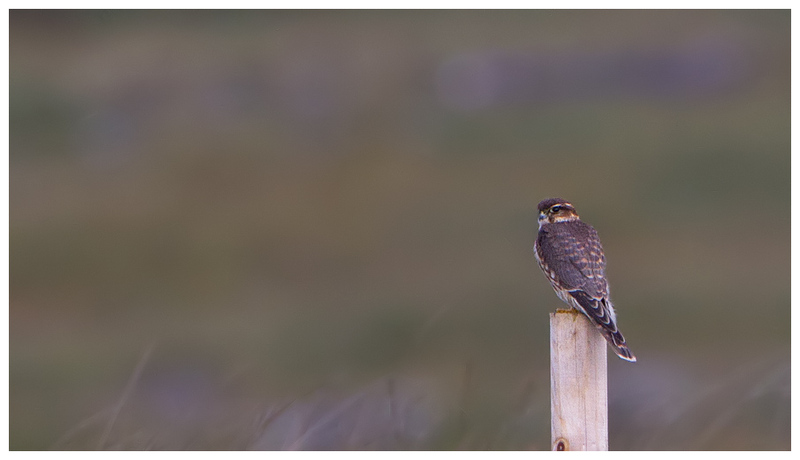 For once there were some hen harriers on the marsh, but both dropped out of sight. Was good to see some small waders around though, with golden and ringed plovers, dunlins and a turnstone feeding from the exposed mud. 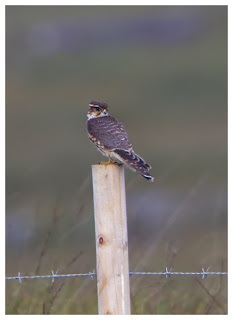 But too far to bother with for shots, especially having seen the golden plover in such magical conditions in Shetland. 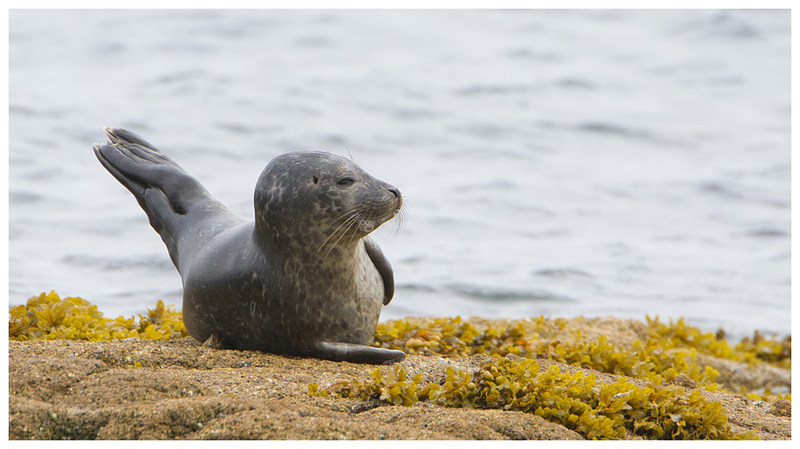 Photographed a lone seal sat beside Na Keal, which was something at least! End of the first week already, and a wet day initially, with driving rain blowing down the lens each time I dared poke it out the car window. As with last year, one of the local WTEs attempted to catch one of the herons on the loch, this time just along the lochside from where I was parked, but failing. The normally vocal herons scattered in panic, and the eagle headed back into the edge of the low cloud to plan another attack. After another pub meal, we saw glimpses of a juvenile golden eagle in the glen, searching for somewhere to shelter from the driving rain. But it wasn't an evening to be staring up at the sky, and the warmth of the cottage tempted us back. 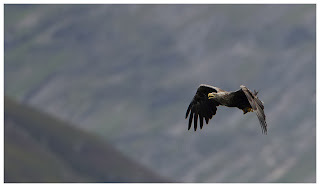 With Steve and Ann already in Oban, maybe the second week would provide some better luck with the hen harriers and more magic with the eagles?